Happy Friday, everyone! Since I haven't shared any flat lays lately, and because Wednesday's post was so labor intensive, I am keeping the content light and easy today! You may have already seen these flat lays if you follow me on Instagram. And as a reminder, you can always see all of them at one time by clicking on my flat lay hashtag. Let's just go ahead and jump right in! After two weeks out of the office, I felt like I needed to dress like an adult on my first day back. Blazers definitely say "adult" to me, but this plaid one is so fun that it still feels like *me. * You can see proper photos of this on me in this post here. 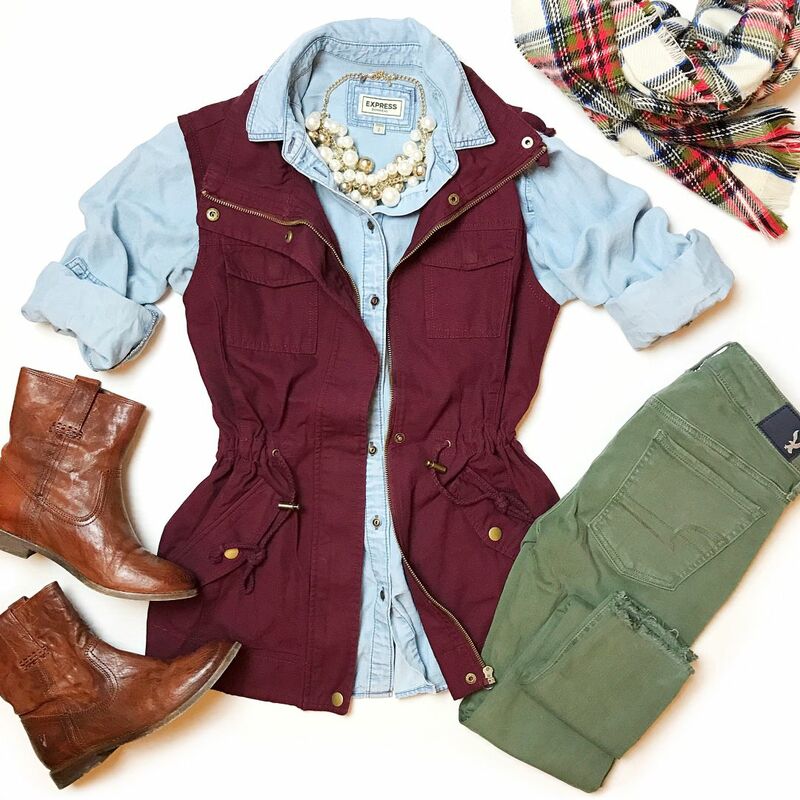 Scarf: H&M | Vest: Macy's | Chambray: Express (option) | Necklace: Express | Bottoms: American Eagle | Booties: Frye "Anna"
Two things I don't tire of are this vest and my olive skinnies. Lucky for you, I've remixed both of these pieces. You can see other ways I've styled this vest (and all my other utility vests) in this post here plus other ways I wear my olive bottoms in this post here. I first came across this Modcloth cardigan back in 2013 when I was putting together 30 outfits using 30 pieces. You can see that original post here. It's amazing that after 3 years that exact cardigan is still available! I can certainly see why! And, I now have it in 3 colors. You can see the most recent time I wore this cardi in last week's post here. 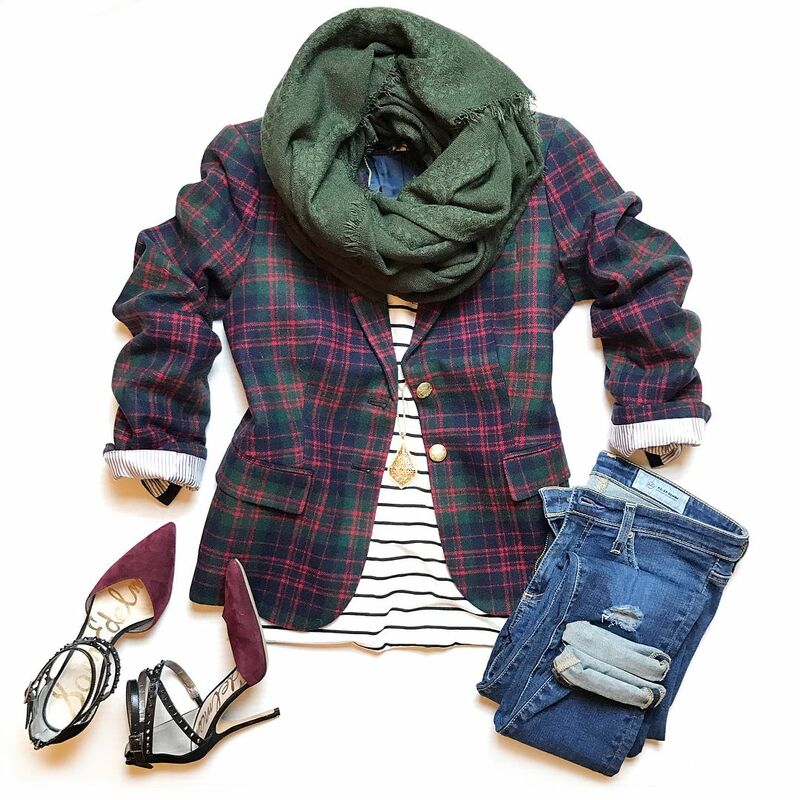 The front view of this outfit was part of last week's random roundup post, but I thought I would post this flat lay so you can get a better look at this flannel! Also, you couldn't really tell in the mirror selfie of this outfit that my knit jeggings are actually a deep forest green color, not black. I've had an itch to wear this cardigan again. Stay tuned to see how I style it next! Told you it was going to be short and sweet today! We don't really have any plans this weekend so I'm looking forward to just catching up on life a bit! Hope you have some fun and rest, and I've said it before, but enjoy your long weekend if you have Monday off! This modcloth cardi looks so cozy, I rarely shop there I don't know why. 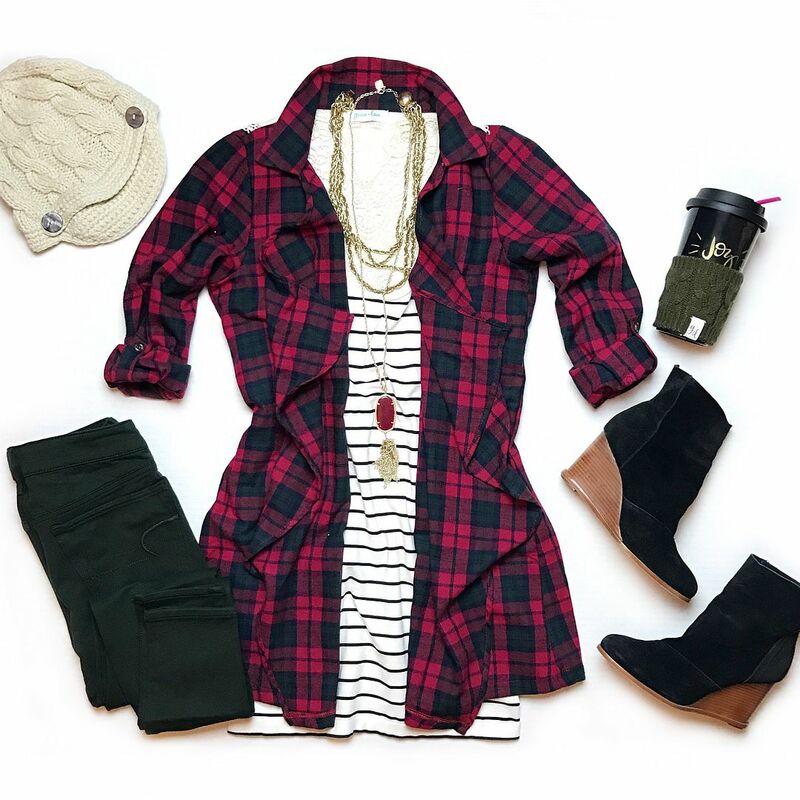 So many cute outfits and so many cute pieces! I have always liked that Modcloth cardigan (it has been around for ages...I knew about it even before I blogged!) so I don't know why I've never purchased it myself!